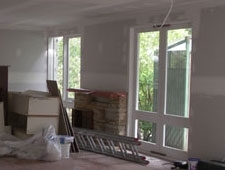 Kitchen Renovation – Getting the electrical right was a lot trickier than I expected, especially since we had to cover everything from power points to ceiling speakers. I never thought I’d be so excited to see a plain white bath delivered. But I was! Compared to our original tiny bath, this is nearly the size of a lap pool. 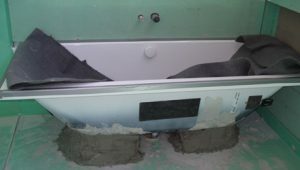 The bath tub was eventually lugged upstairs to the bathroom, where it will sit until the tiling is completed. Even though we’ve already hit the six-month stage, we’re not even close to finishing. 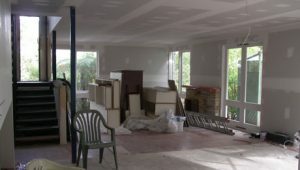 All the structural work is nearly finished, and the open-plan living/dining area looks huge. Upstairs, the extra bathroom wall was completed, and I can’t wait to have a long soak. Apart from all the building work, Frank has finally completed his ‘to-do’ list (hooray!). His list had one or two topics, while mine has about 200. The sound system has been his major priority. He’s wanted to make sure we’d have great speakers, and they’d be connected to the amp and the TV for surround sound. I’ll have to admit, he’s really done his research to get the right ones. I’d only thought of getting wall speakers, but he’s decided to get ceiling speakers – in the living room, kitchen and even the playroom! He explained that ceiling speakers are easier and less costly to install. I’ll go along with that, but when he suggested that it would also be a great option for the bathroom, I had to pull the plug on that indulgence. If that happened, he’d never get out of the bathroom again! This was all part of the electrical scheme, put together by Jeff’s regular electrician, Brian. When Frank found out Brian was also obsessed with turntables and classic vinyl albums, they became best buddies. I managed to interrupt and we finally put together a lighting plan. It’s a mix of pendant lights and downlights. Brian also added a few wall lights since there were a few areas that would have been a bit dark. He also suggested adding dimmers for various lights. I don’t think I’ve ever lived anywhere with a kitchen, bathroom and living room that can be dimmed for an intimate mode. Not quite sure when we even need an intimate kitchen – but I’ll go along with Brian’s idea. Another nifty idea is the dual switch – it means a light can be turned on or off from different areas. We’re using dual switches at the top and bottom of the stairway to make our life easier. We also had to go through a thousand tiny electrical details, covering power points, TV points, and phone jacks. 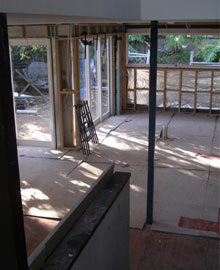 We’ve had to finalise everything before the cabinetry and wiring is completed. It’s meant that I’ve had to decide where we are going to place any standing and table lamps, and even where I’ll need to use the vacuum cleaner. We also had to position all the power points in the kitchen, thinking about our small appliances and various recharge units. To get an idea, Brian suggested, we count all our plug-in items and think about future purchases. I know Frank is desperate for an espresso machine, so we’d better figure out where it will go. Outdoor lighting was also on the agenda – figuring out where to put any uplights or bollards. As Brian said, not only does it have to look good but it’s also a safety issue. Frank was only concerned about the right lighting to create a great mood for outdoor parties. At this point, that was the last thing on my mind. I’m trying to survive day by day, while he’s picturing Saturday barbies with the entire footy team. He even managed to sneak in an external power point near the barbie – he said it was for extra lighting, but I know he’ll be plugging in some kind of outdoor sound system. After Brian had finally put together the full electrical plan – with every switch, light and power point shown – we knew we were getting closer to the finish.